"Should I try color my hair?" - a question that I asked my hubby more than hundred times in past few months. Despite his immediate consent every time, I could never override my apprehensions about damages caused by hair colors. Moreover, I have no major greys, so I managed to survive without taking the idea any further. A few days ago I got to receive a special hair color hamper from Godrej Nupur containing few packs of their Crème hair colours infused with coconut oil and henna. 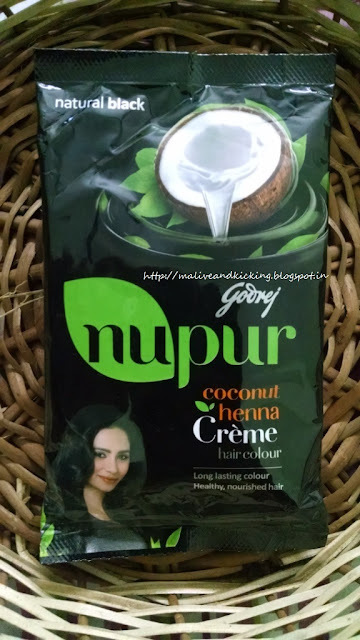 Initially I was scared to apply the hair color, but then the presence of beneficial coconut oil in the formulation prompted me to set aside my fears and do take this hair color challenge at home. Ingredients : Aqua, coconut oil, henna leaf powder, ethanolamine, petrolatum among others. 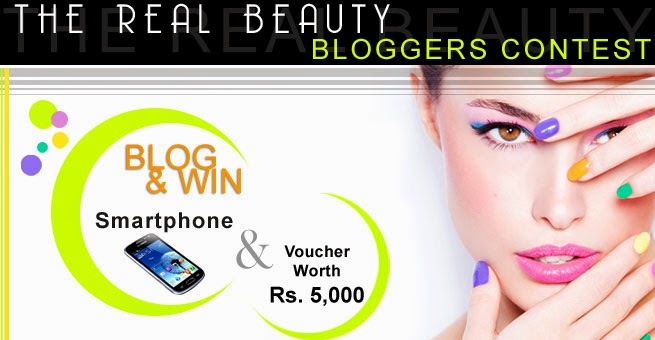 I had been adoring my long black tresses always and actually couldn't imagine experimenting on them for any reason. But my hubby encouraged me to go for a different shade than my usual black hair for a nice change in personality. So I decided to use the Dark Brown shade that is somehow close to my original hair color and won't seem extremely transformed. 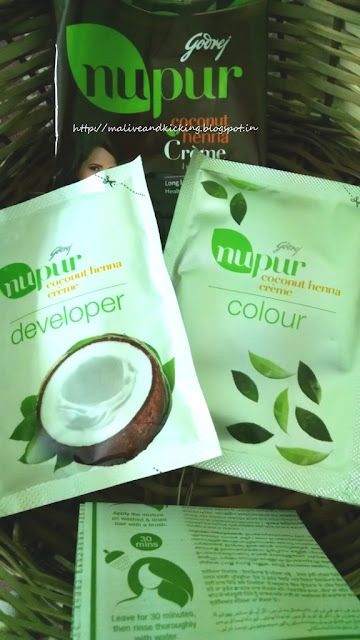 I mixed the entire content of colour and developer in the sachets in a glass bowl because the brand has simplified the task of measuring the quantity for appropriate mix and has provided the pre-measured contents separately packed for hassle-free experience which I appreciate. 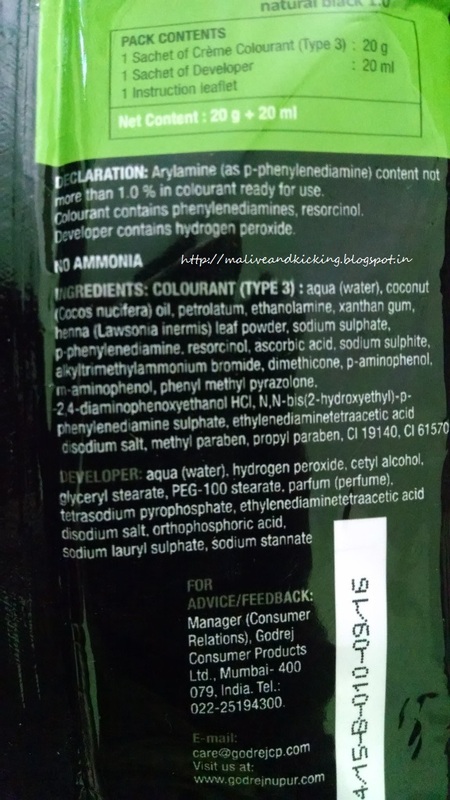 I like the familiar coconut oil smell in the developer. 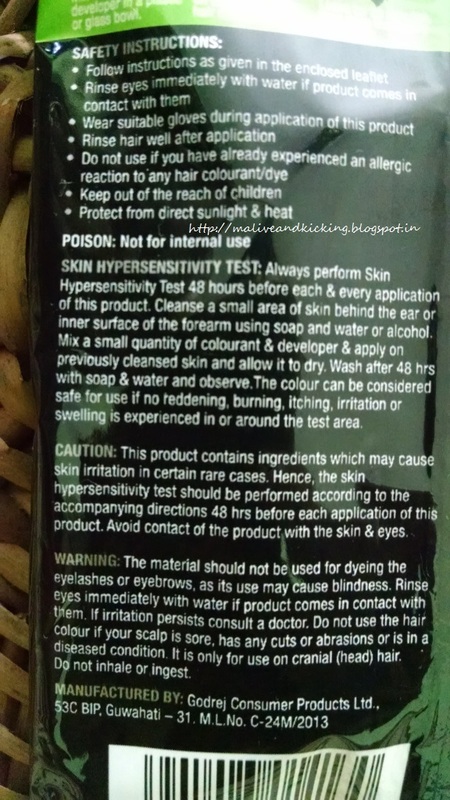 Before I could apply the Dark Brown hair color on my hair, I followed the safety instructions quite in detail and took the patch test to check for hyper-sensitivity of my skin by applying a small amount of mixture behind my ear, but thankfully it didn't cause me any sensation, inflammation or itching. Now, after being passing the patch test, I was more confident to color my hair. I applied the hair color using coloring brush, but missed having a pair of hand gloves in the pack. The consistency of mixture makes it easy to spread. Leaving the hair color on my hair for almost half an hour, I gave it a thorough rinse. The hair color came out easily and gave me a newer look. 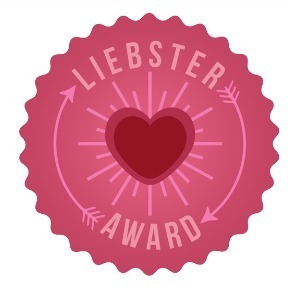 I am really satisfied with the coverage it gave to my hair as well as the softness and lustre to my hair. 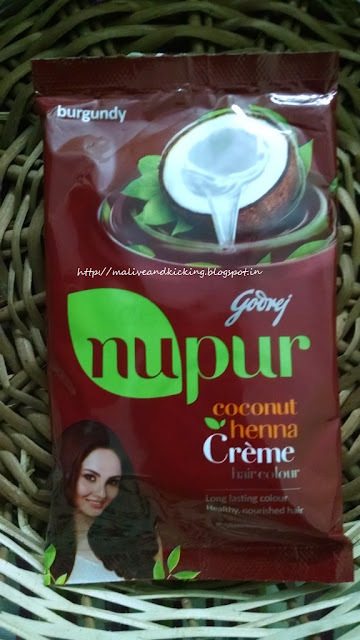 I may safely recommend Godrej Nupur Coconut Henna Crème Hair Color for a beautiful and healthy hair coloring experience at home. Pre-measured colourant & developer sachets. Nice fragrance of coconut oil. Leave hair soft and shiny. I wish there were hand gloves in the pack and I won't mind paying few bucks extra for that. 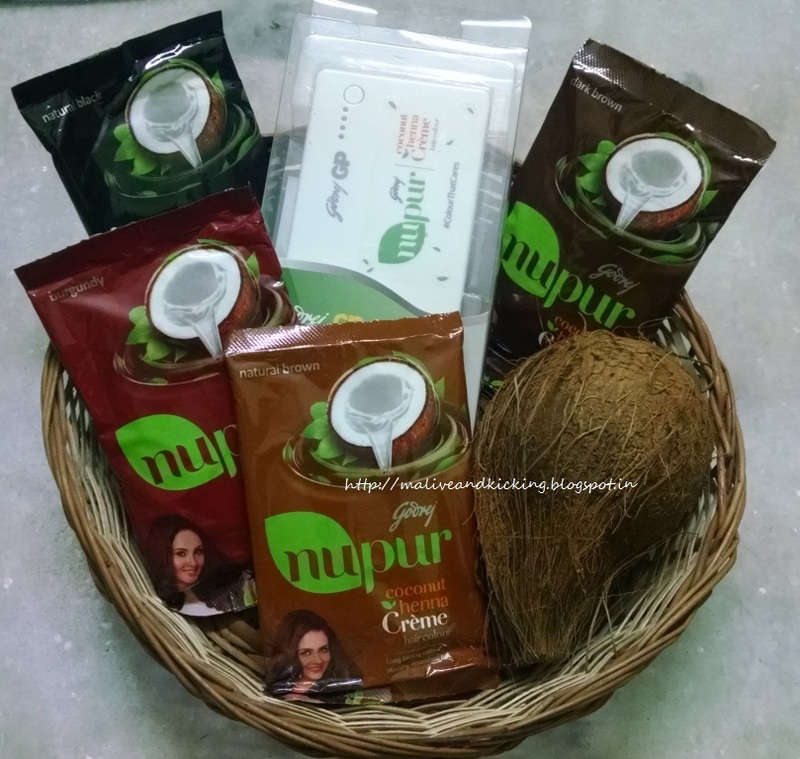 The quantity in each packet is sufficient for small to medium hair length or is suitable when only partial greying is to be covered, else for longer hair more packs are to be used. 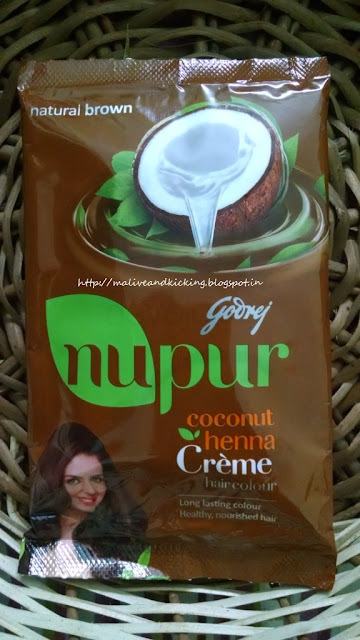 Godrej Nupur Coconut Henna Crème Hair Color is an economical hair coloring solution with goodness of coconut oil and henna. The 'No Ammonia' factor makes it more acceptable to many. 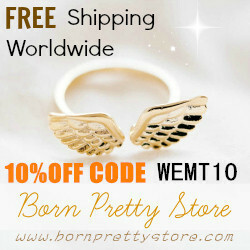 Each variant priced at as less as Rs. 39 is a win-win situation undoubtedly. Labels: ammonia free, Coconut Henna Crème Hair Color, Godrej Nupur, hair care, review, Review. thnx Jaya. It was my apprehension too. but it worked well. I don't believe any brand on this earth which claims to be ammonia free. 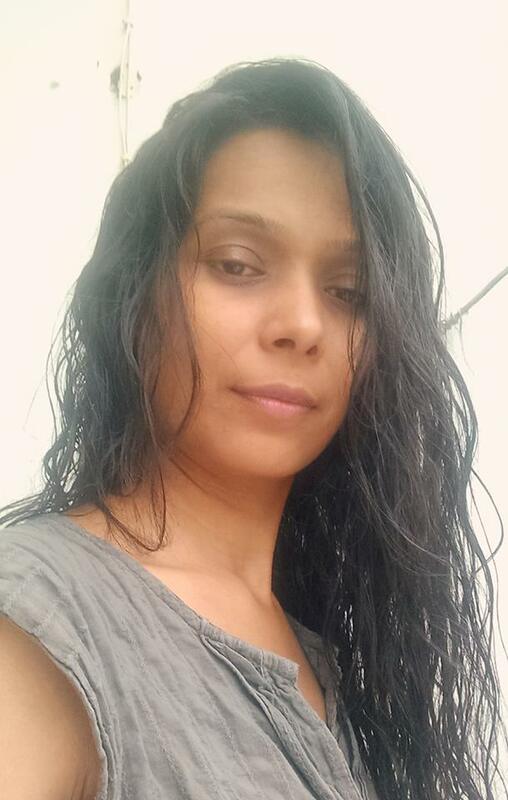 N I have never and will never colour my hair in at least this birth. I hate colouring hair, it adversely affects our hair. 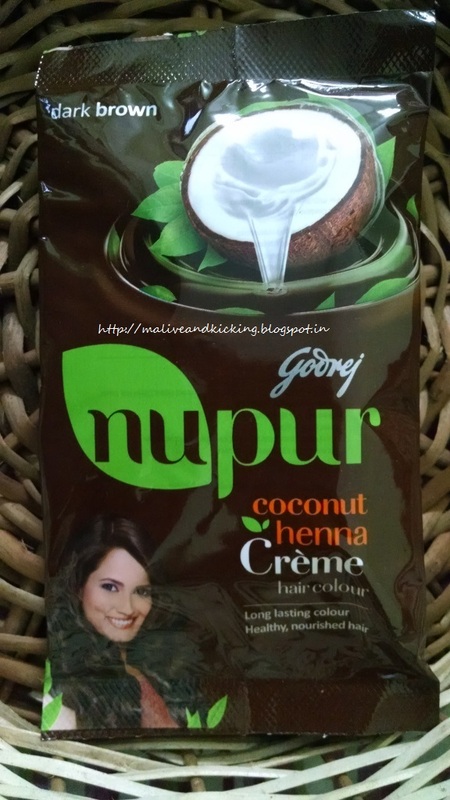 Be it Loreal or Garnier or this Nupur!!! 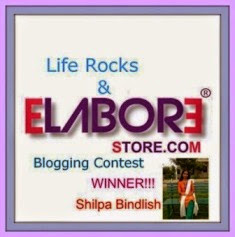 I am sure you will look pretty even in ur natural grey hair as u grow old ;) I appreciate ur conviction.